Toyota 4Runner 1984-1995: Why Won't My Truck Start? Checking the basics is the place to begin. There are many easy things to check first. Your Toyota is a pretty simple machine but if you plan on doing DIY tasks, you really need a Factory Service Manual (FSM). If it will not start, then check the basics and build from there. An engine basically needs air, spark, and fuel to run. If one is missing, the engine will not run. Though pretty basic, your truck does have some electronics that can drive you to craziness. These vehicles were built when electronics had not taken over all vehicle functions and some components were not sorted out. Before getting to them, there are easy things to look at. Follow along to see if we can get you going again. First, let's check the air part. 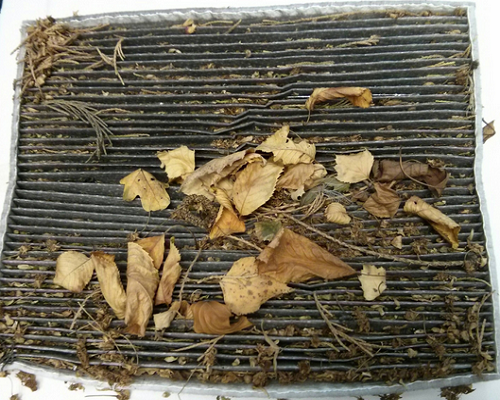 I know it is a 'duh' but if your air filter is clogged, the engine will not start. Granted it has to be pretty bad, but if you were off-road in dust and water, it is possible. Figure 1. 22RE air cleaner, AFM location. Figure 2. Clogged air filter. The Air Flow Meter is located on the air cleaner assembly, so if the filter is not clogged, might as well check it now. It is a common problem of your truck. The FSM tells how to check it. Figure 3. AFM with top removed (advanced). While you are there, clean out the air cleaner assembly. If that is good, check the spark part. You must have spark to ignite the fuel and air. This will sound silly, but be sure that the battery is charged. A multimeter will give you a read out in volts on the battery. No power means no spark. 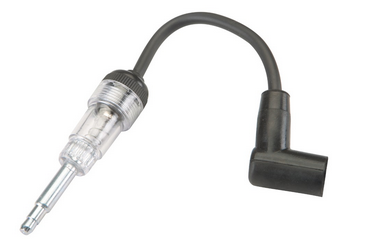 Take a spark plug wire off and hook up a spark tester like the one in Figure 4. There should be a strong spark. Check all of the fuses. There may be more than one fuse panel, so this is when your FSM comes in handy. There may be a fusible link hidden somewhere, too. 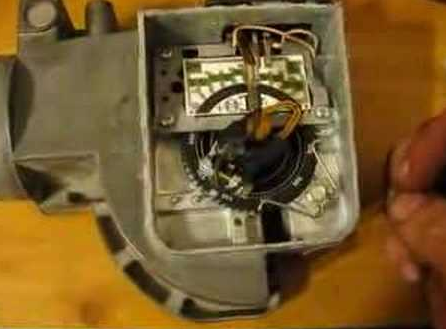 Check the ignition coil with a multimeter or try a known good one. Check to see if the rotor is turning in the distributor. If it is not turning, see below. Spark is good, none is bad. You can purchase a spark tester but an old spark plug works fine. Fuel is the last part of the trifecta. No fuel equals no start. This is going to sound ridiculous, but be sure that there is gasoline in the tank. Gauges are not always accurate. You can just pour a small amount of gasoline in to know that there is at least some there. If there is gas in the tank, then check to see if you can hear the fuel pump run. Listen closely for the pump and turn the key to the "Run" position. The pump should run for a short time. If it does not, check the fuse. If you have gas and the pump is pumping, make sure fuel is getting to the engine. 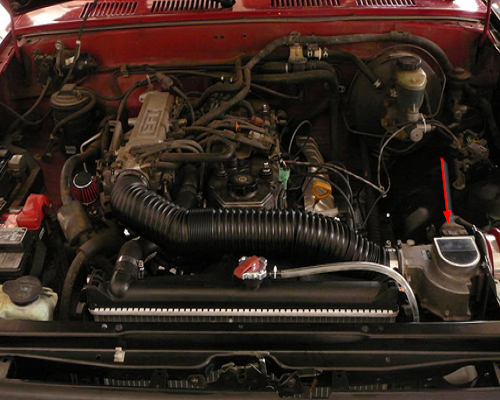 Fuel injected engines use a cold start injector to provide extra fuel when starting. It is easy enough to pull the injector to see if fuel comes out. Of course, be VERY careful if you check for fuel this way since it is dangerous. If fuel is present, then fuel may not be the issue. If there is no fuel at the injectors, the fuel filter is a likely culprit. On a 22re engine the fuel filter is in a terrible place; under the intake manifold on the engine. Toyota says it is a lifetime filter, but ethanol enriched fuel wasn't around back then, so it can clean all kinds of 'stuff' out of tanks and send it to the engine. Figure 5. Fuel filter on 22re engine. If checking these prove no problem, see below. Knowing when to say "when" is important. You do not want to spend a lot of money of parts you don't need. Sometimes you just have to say "when." These can be the issues. Some of these are known issues, but require more in-depth troubleshooting. Like a broken record, a Factory Service Manual can help you diagnose and test these. Toyota Tundra: Why Won't My Truck Start?